I recently had the opportunity to try out a fun new to me online tool for creating gifts from photos. It’s called MyPhoto and let me tell you it’s super easy! You have the choice of either uploading a photo to the website or you can email the photo to 123@myphoto.com then watch your inbox for a link. Either way you will get the same results – every product on the website personalized with YOUR photo. I love it! Finally no more trying to visualize how your gift will look ahead of time. You get to actually see how it will look right on your screen. MyPhoto offers a wide selection of customized photo gifts with price ranges from $10-$200 so they have something that will fit every budget. I was able to get both of these custom photo gifts for $50. I do want to point out that the glare on them is from taking a photo for this post. They are actually both beautiful and flawless photos. Each photo was HD printed onto high-quality aluminum and arrived ready to display with a wooden stand. They really are quite elegant pieces. 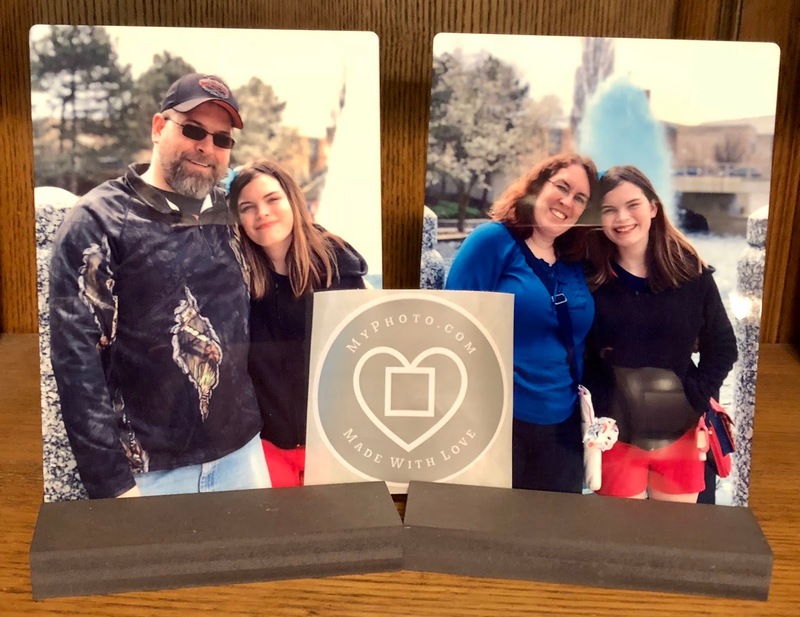 I picked these two photos from a recent weekend trip we took with our daughter because I thought they would make nice Father’s Day gifts for my husband to put on his desk at work. Production and shipping is super fast too, your order will be delivered within 5 business days from the time you place it. Now that’s what I call super fast delivery, and without any expedited fees either! So these make perfect last minute gifts for any occasion really. MyPhoto was founded with a single mission: To create the easiest and fastest way possible for photos on your phone to become amazing products and gifts. It’s this singular vision that has driven every decision the team makes, because at our core is an unwavering passion to make memories come to life. Our on-demand technology allows someone to create a custom photo product in less than 60 seconds, and get it delivered to their doorstep in 5 days or less. We call it “Crazy Easy. Crazy Fast.”, because we know how important these favorite photos are to you, and getting them to you fast is just as important to us. Every product we create is crafted with care. We take customer satisfaction so seriously, that we kick it up a notch and provide a 100% Smile Guarantee. If our customers don’t smile when they open their package, I’ll make it right.